The 2019 Berkshire Wedding Expo is almost here! 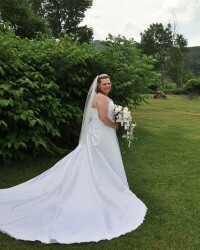 We are 100% dedicated to helping Brides who are getting married here in the beautiful Berkshires! BerkshireBride.com is designed for you to scroll through and come back again and again as you need it in your wedding planning process! Our services are FREE for you to utilize! We've been marrying brides since 2003! Our mission here at Berkshire Bride is to "teach" one how to get married! We furnish the resources and let the brides take the reins and make the decisions for themselves! In the stages of planning your wedding, we encourage you to stay connected to Berkshire Bride and take part in our ever-popular online contests! Great ways to stay connected are through social media! Of course sources like Pinterest allow our Berkshire Brides to visually see what's available to them. Berkshire Bride represents OVER 130 Berkshire County wedding professionals who are all eager to help you make your wedding day one of the most amazing days in your life! Some of our professionals have been in business for MANY years and others are still gaining experience but offer unbelievable talents and ideas! There are multiple articles, tips and more for you to browse through and get ideas from! Feel free to pop us an e-mail to ask questions or to set up a consultation! Berkshire Bride firmly believes that knowledge is power! We have some great vendor interviews, specials offered by our wedding professionals and more that you can read up on to be informed! There are lots of contributors and we couldn't do it without their amazing expertise and insight! Berkshire Bride hosts a variety of events throughout the year to help Brides through their wedding-planning process. SOME of the great parties and functions include the Hair & Spa Show, the Count Your Carats Cocktail party, Holiday & Special Occasion Makeup Seminar and of course, THE Berkshire Wedding Expo Weekend! To make being a Berkshire Bride FUN, there are several online contests for you to enter to WIN FREE wedding "stuff"! Berkshire Bride is constantly giving away useful prizes for you to cut the cost of your wedding down. Let's face it...weddings are expensive. Winning wedding prizes sure can help! Trust your LOCAL, Berkshire County-based wedding professionals!